Chicken enchilada are one of the great simple foods that seem like they could be a lot of work but the reality is they really don’t take that much effort at all. Another great aspect, they don’t really require too much to make them great. Needless to say, they are a favorite at my house. Peel the outer husk from the tomatilloes then quarter them, rough chop the jalapeno (for less heat remove the ribs and seeds, or leave them in.). Place garlic, jalapeno, tomatilloes, and lime juice in a pot with a little water (for steaming). Bring to a boil, then reduce the heat and simmer for about 15- 20 minutes (the tomatilloes should be broken down). When done, blend with a hand blender or a standing blender till smooth. Mix chicken, onion, and enough sauce to wet the mix. Portion the mix into the tortillas rolling each and placing them into a baking pan. Cover the rolled tortillas with sauce, then place in 400 degree oven for roughly 20 minutes. Blend the avocado, sour cream, hot sauce and lime juice till smooth and creamy. Top the finished enchiladas. 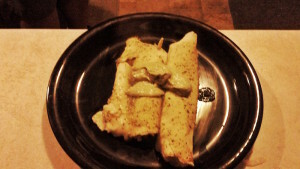 4 Responses to "Chicken Enchilada #realfood"
I have done that as well. And I have rolled my lasagna like enchiladas in the past as well.